We look back on a year filled with newly forged partnerships; an intensified involvement in the pretrials at Guantánamo Bay Prison after we joined the NGO observer pool of organizations traveling there; many screenings and subsequent discussions of IN OUR SON’S NAME and our amplified voices heard in the media, at conferences and on college campuses nationwide. 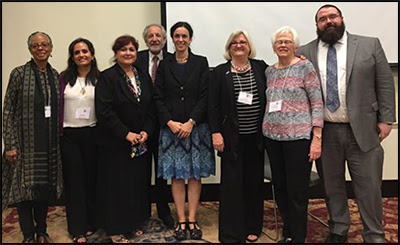 Participants of the Reclaiming Our Democracy conference in Richmond on September 16/17, 2016: from left to right: Prof. Dr. Renee Hill, Virginia State University; Mona Siddiqui, Assistant Attorney General, Virginia Office of the Attorney General; Talat Hamdani, PT member; Steve Levinson, ACLU of Virginia; Adria Scharf, Executive Director Richmond Peace Education Center; Claire Guthrie Castañaga, Executive Director ACLU of Virginia; Ellie Meleski, Richmond Peace Education Center; Adam Bates, Policy Analyst with the Cato Institute Project on Criminal Justice. Moving Forward: CLICK HERE to view our members’ statement on the State of the Nation. In Support of the Iraqi Civil Society Solidarity Initiative: CLICK HERE to view the entire statement. Join the next PT Community Connection Call! Mark your calendars for the next call hosted by PT member, Antonio Aversano. This is a rejuvenating way for those of you 9/11 family members to nurture and inspire one another as we casually come together and connect. Join The Next Call: Thursday, January 5 , 8pm EST/ 5pm. Dial In Number: 515.739.1020, PIN: 652194. Help us disseminate our Promoting Peace guide among your friends, families and share it with your colleagues. In Our Son’s Name goes to Spain! The film was shown at the Human Rights Festival in Barcelona on November 30. A translation of the film into Spanish is in the works as well. Calling On The Next Generation @PeacefulTomorro! We are working to more fully engage those of you students and young professionals among the PT membership who joined because you care about our mission and goals. Please contact the office to explore how to make further meaningful steps towards #peace and #justice with you marching with us and contributing your ideas and vision!